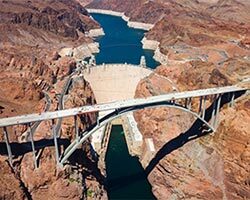 Named one of the Top 10 Construction Achievements of the 20th Century, the Hoover Dam continues to please crowds daily for more than 70 years. 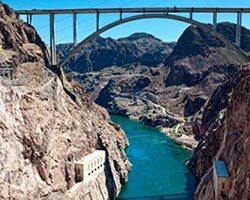 Take our Las Vegas Luxury limo tour and experience the magnificent Hoover Dam! Once you are there, your chauffeur will wait while you take photos and enjoy breathtaking views. If you want a more in-depth experience, you can choose to purchase tickets at the visitors' center for the Dam and Power Plant tours. Relax on the return back to Las Vegas with a complementary bottle of champagne, red wine or white wine. Because of heightened security, all vehicles attempting to cross the dam are subject to inspection. Note: This tour has a maximum 4 hours in duration starting from your hotel. This tour is one way to and from the Hoover Dam with no Stops. 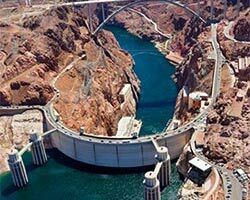 There is a one hour stop at the Hoover Dam. If more time is needed then we will charge in 30 minute increments.